Rapid Setaflex is a polymer modified, flexible, cement based floor and wall tile adhesive. 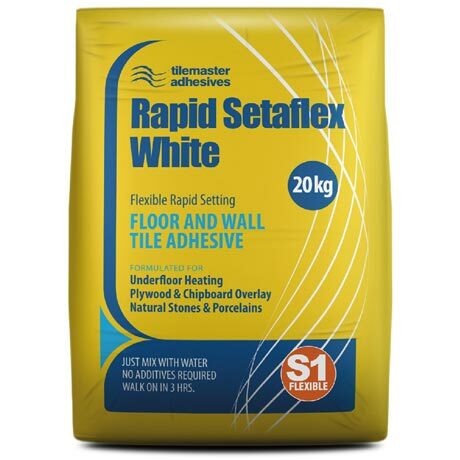 Rapid Setaflex has been developed for fixing a large variety of tiles to surfaces subject to limited movement and/or vibration such as plywood overlay, chipboard overlay and under floor heating. Its rapid setting capability allows for light foot traffic and grouting after 3 hours. Rapid Setaflex is suitable for use internally and externally and it is unaffected by frost after setting. Coverage: 20kg will cover 5 – 6 m² at 3mm thin bed application.